You’ve seen my blog so you probably know that I LOOOOOVE historical fiction. LOOOOVE it. I am a self-confessed history nerd. I haven’t read a murder mystery in a long time, but I love them too. Book titles can definitely be confusing and I say it is completely understandable to mix up two similar titles. 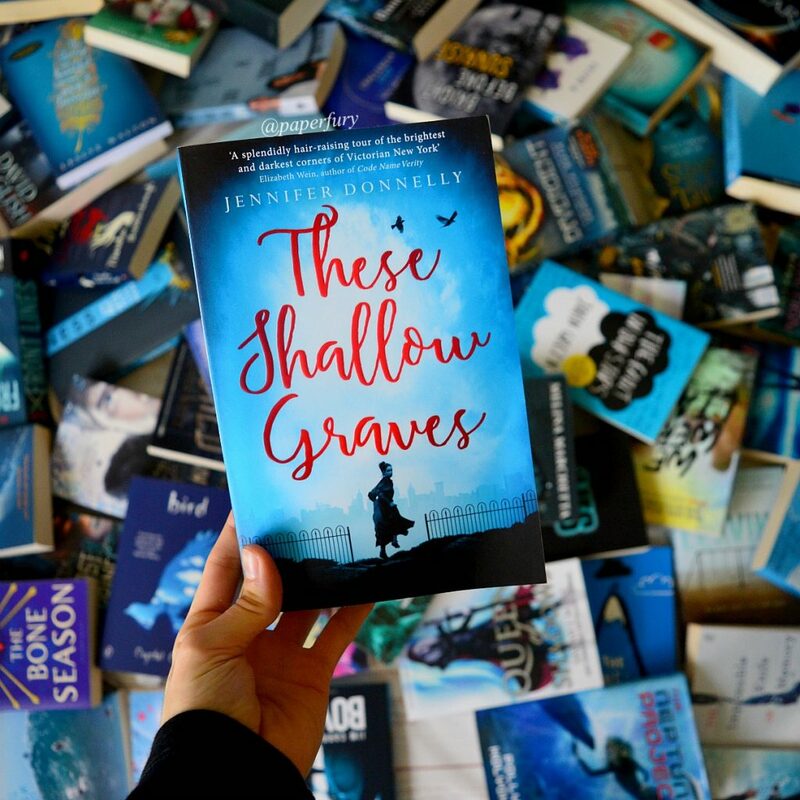 I have not read this book, though the title sounds familiar – I’m sure I’ve seen other blogger talk about These Shallow Graves, but nothing you mentioned in your review sounds familiar. IDK ¯\_(ツ)_/¯ Some of the aspects sound very cool (and I’ve enjoyed a Jennifer Donnelly book before, so that’s promising) but I think I’ll pass on the predictable romance. I’m so over the rich person falls in love with poor person trope. I don’t think this one is for me, really, but I’m glad you somewhat enjoyed it Cait! 🙂 Sass is such an important thing, omg. More books need it. Sass IS so important, omg. I get confused when I read a non-sassy book. Like what is the point???? What are people doing with their life if not being sassy???? Oh and you must be pleased. Because of your reviews, I finished both The Crown’s Game and This Savage Song in a span of one week. I ACTUALLY FINISHED THIS SAVAGE SONG awhile ago and I am in a wreck (Alice HOW ARE YOU HERE, Isla OMG, and Kate in Prosperity now what?!) I ADORED BOTH BUT THIS SAVAGE SONG MUCH MORE THOUGH. V. E. Schwab’s writing is amazing and it wants to make my cry thinking about it sometimes🌟 But Evelyn Skye’s was a decent one as well! YUP. It really really reminded me of A Mad And Wicked Folly.😂 I think that’s where I got the deja vu moment from?? Having the rich-toffy-girl-fall-in-love-with-the-lower-class just seems like a very popular Historical Fiction trope for some reason. ANGST. I’m pretty sure it’s set in America actually. New York? Your book photography game is getting stronger every day 😀 Love these. I’ll add this book to my TBR as well. As I was reading this, I did think of Jackaby, which I love, largely for its taking the conventions of the historical fiction genre and tossing them to the winds. It also made me mentally compare to Clockwork Angel/Prince/Princess, which tried way too hard, and I just couldn’t get into it. There actually was no milkman!! HOW DARE THIS BOOK HAVE NO MILKMAN. Ahem. I like watching murder mysteries over reading them too.😂 I feel like you can get more clues from TV/movies?? And like start solving it too? Whereas with books you only get what you’re given. Boo. I like to solve things hahah. Yes! Youre review gives me hope! I read so many negative/neutrale reviews about this book, but I bought it… two months ago, I think. And it’s stuck in my tbr so far. Anyway, I was ull of doubt about my own purchase, bu now I’m more. Plus Jo.! If she’se naive but adorable, then she’s my new best bookish friend. I love cute character. Beacuse it’s like I need to hug the and that’ a really amazing thing XD I also love the fact that during the book she tries to learn. Oh good! 😀 I’m glad this was helpful for you. And yesss, Jo was definitely full of win, particularly with her character development. It is definitely worth the read I believe!! Great review. I love historical fiction and murder. I’ve been thinking about reading this one, but it’s not high on my priority list. 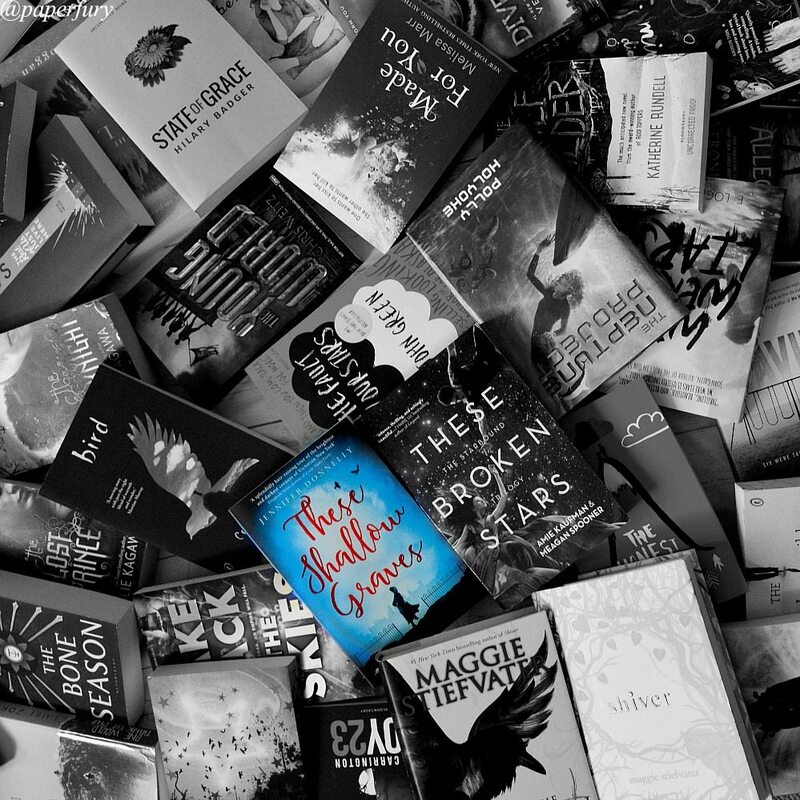 There are so many books, so little time! I’ve read this one and I really liked it! I definitely agree with a lot of the points you made. The audiobook was a great listening experience. Ooh, the audiobook probably would’ve helped me with the confusion in the mystery.😂 I tend to be a better auditory learner tbh. I’m glad you loved it! I stole my friend’s copy of this right when it came out and read it on vacation…and I can’t actually remember much of what happened? But I do remember I liked Oscar, and how Jo politely yet thoroughly squashed the whole “you’re not like other girls” thing that Eddie had going on for a while. AND, YES, I GOT IT CONFUSED WITH SHALLOW GRAVES TOO. 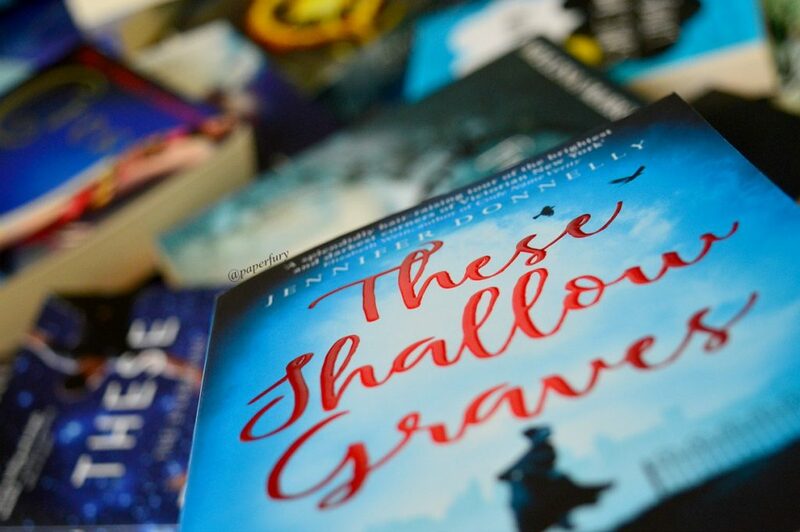 I think because Shallow Graves got a little bit more press, and that’s the book I thought I was reading. In my defense, the US version of the cover looks very zombie-ish. YES! I was so so happy Jo slapped down the “you’re not like other girls” thing…like omg bless Jo and bless that phrase and BLESS THAT IT WAS THERE. Ahem. AHHH THANK YOU GRACE. *flails happily* It’s always a good time for a Sherlock muuuurder gif amirite? HISTORICAL FICTION SCARES ME. WHY IS EVERYONE ALWAYS RELATED OR KNOWS SOMEONE’S AUNT’S COUSINS ILLEGITIMATE DAUGHTER NAMED FAGIN. OMG. And I do think that a lot of these kind of books sound the same after a while. hahaha. I mean, it was well written!! But yeah. This is basically my relationship with thrillers: after you’ve read a few, you can basically predict all the rest. 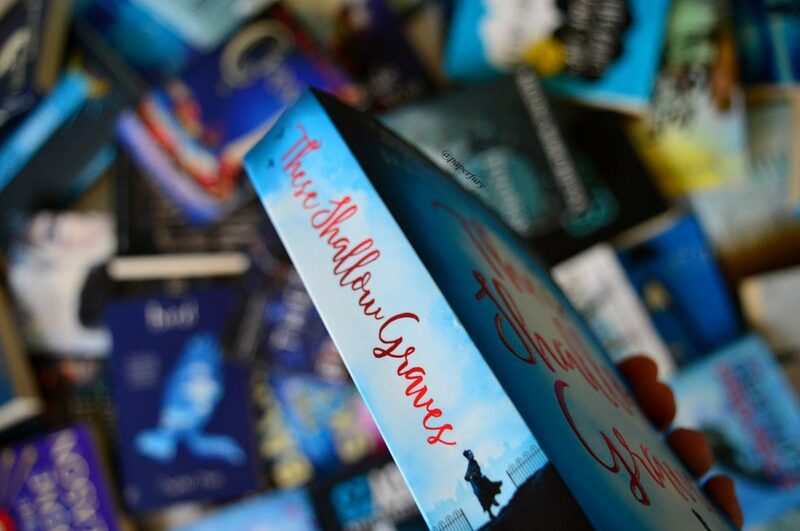 When I first read These Shallow Graves, I ADORED it. You have brought up some very good points, and I will admit this book has flaws, but IT’S STILL PRECIOUS TO ME, OKAY? I read it in one day because I could NOT put it down. I really liked that Jo acted as though she was from the past, and not some modern girl in a Victorian world. Despite being from so long ago, I related to her quite a lot. And then there’s EDDIE. He was just a precious little muffin. In the last 4th of the novel where things were going wrong, and things were quite predictable with the romance, I was still concerned/mildly distracted from my tea. JOURNALISTS HAVE FEELINGS, TOO, OKAY? It probably helps that I devour historical romance as though it’s my child and my name is Kronos. Oh Cait, I love your turn of phrase. 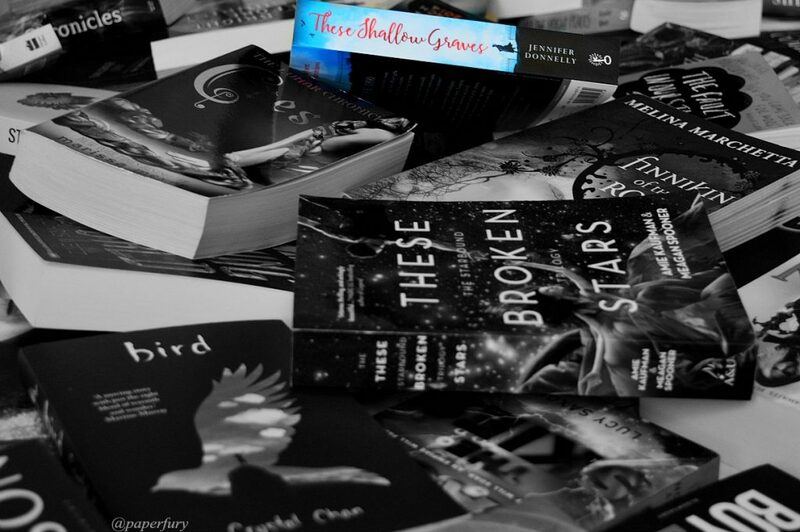 I got Daughter of Smoke & Bone and Shadow and Bone mixed up, too, before I read them. Now I realize they’re very different and I know which one is which! One book I enjoyed was Jennifer Bradbury’s Wrapped. It’s a historical mystery, though not necessarily a murder mystery. SAME! I actually started reading Daughter of Smoke and Bone and thought it was Shadow & Bone. And I’m like a chapter in and all “Where is the Russia?? ?”😂 Now I never mix them up but YEAH. That was awkward. Ooh, I shall need to look up Wrapped! Hmmm…seems interesting enough, but I’m sure there are a lot of better Victorian murder mysteries out there. Love your pictures!! I bet that pile of blue books took forever to put back on the shelf lol! YOU SHOULD READ NIMONA. IT HAS DRAGONS. AND MURDER. I WANT TO. IT’S ON MY WISHLIST. Haha, this does sound interesting! Murder mysteries are always fun! But you say there are a gazillion different characters, all equally important? Eek, how will I keep up? It’ll definitely get so confusing. I’m not a fan of historical fiction. Most of the time, I don’t tend to explore other genres cause I’m afraid of not liking them or worse, not finishing them when I start to get bored. 🙁 I do, however, have always wanted to read Jackaby but I haven’t had a chance to purchase a copy yet. Hahaha! That’s fair! I grew up on historical fiction, so like it has a special place in my heart, but I definitely don’t reach for it nowadays.😂 I tend to love to read everything though haha. Ahem. Would you stop making me want to read murder mysteries haha. I remember when you and Zoe raved about Dangerous Girls which I still haven’t read, excuse you, but I can’t waittttt. I’m not a big historical fiction fan either, though some of it is really good esp if the mystery is done well (such as Agatha Christie stuff which is ofc classics, but still! The Diviners fod instance etc). Lmao. I like not-perfect heroines though and people who are capable of groth and learning something — that’s all I want basically so Jo is already a plus in my eyes as far as protagonist’s traits go. YASSSS FOR SASS <333 I don't mind sexism AS MUCH if it's an era thing, you know? But as you said, it's good to have characters who realize this and will turn it in their favor. RIP @ info dump though. Hahahahaha! I'm a trash for all sorts of romance though I don't mind which trope (usually) unless it's insta love. I'm glad it's attraction here though. That I can totally handle 🙂 I'm glad you liked it as a whole Cait! DANGEROUS GIRLS IS THE BEST, THOUGH, SIIRI. WHY AREN’T YOU LISTENING TO ZOE AND ME??? WE ARE NEVER WRONG. *throws it at you* That one is pretty different (and definitely the BEST) than this one though.😂 But still muuuuurder, John. Did you write this review simply for me, Cait? Did you? Oh, shucks. I DID ACTUALLY. I considered starting the review with “Dear Emily, this is a review for you” but you know, I just accidentally forgot to add that in. Thankiu for this honest review, Cait! Your main points are always hilarious, and now it comes with GIF? Haha. Well, I do enjoy a good gif now and then. 🙂 And thankyou! I’ve been curious about These Shallow Graves, because I can always get down with a historical fiction murder mystery! Alas, I’m a bit wary of the way that the plot read as a bit typical to you in some aspects. But I’m also still drawn to it because the snippets you included are very readable indeed. We shall see if I ever wind up checking this out! This is a really good review for this book, especially since you’re not a historical fan! I completely get where your negatives are coming from on this one as I have recently read it. I get how people wouldn’t like the predictability and the fact literally every minor character seemed like they had a significant role later on (yes, I agree that was random that the crazy lady we see at the beginning totally links this mystery together because why not?) but I just didn’t care about the negatives because for me I was rolling in all your positives and laughing at Jo’s ridiculousness and loving the romance. I was also pointing at the book and shouting for all who could hear me that this is totally the way to do feminism in historical fiction for all those folk who say you can’t because it’s not keeping with the era I say screw you you’re totally wrong and this book proves it. I don’t know what it was about this book but I basically loved it so even though I’m sat here nodding along at your cons my brain has chosen to ignore them all and say the book was fantastic. Also, isn’t it the worst getting titles confused because you’re completely expecting one thing and then it just doesn’t happen! I can’t think of an example right now because my brain has died through lack of sleep but I have definitely done that before (many times). I am both a fan historical fiction and murder mysteries so I really enjoyed this one, in spite of it’s problems. I also thought it wrapped up too easily and too neatly. I like a lot of Donnelly’s other work as well. It definitely good but not earth-shattering. Oh I agree with it wrapping up too easily and neatly. Like where EVERYONE (even the random lady in the street?!) was all tied in?? Like very convenient and I am the suspicious. *sighs* But it was still a good read! Oh this sounds right up my alley! I love a good book with a bit of sass. You also take some good bookporn pictures, damn. Why thankyou.😂 Taking bookish photos are like my FAVOURITE hobby these days. YAY! I hope you like it if you do read it, Zoe. 😀 It was mostly glorious if a bit predictable hhahah, so yes, the struggle to find something totally wowing is very very difficult. I want to read this book so badly now oh my goodness I need a copy ASAP! DEFINITELY GO READ IT. FOR THAT PART ALONE.😂 Jo is so naive it’s adorable hahhahah. Also, on GoodReads it says it was published Oct. 2015? Me very confused. I’m sorry there were no zombies. That must have been a huge disappointment. Thanks for enlargening (is that even a word?) my to-read list! Publishing dates often differ from country to country. 😉 So it’s only publishing here this year. Hope that makes sense! IT IS SAD THERE IS A LACK OF ZOMIES. *wails* What must I do to get a few zombies around here omg. Oooh, Caaaait! I’m not a historical fan, either, but you make this sound interesting! But I can’t be doing with the pish-posh. I don’t know! 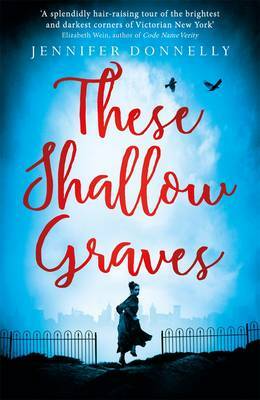 However, I am all for Shallow Graves, that book sounds awesome! OMG I ADORED THESE SHALLOW GRAVES. I randomly picked it up from the library, knowing NOTHING about it. It really surprised me and I loved it. I must get this, I love Victorian murdery things!